I started listening to shortwave pirates in earnest only a few years ago. I had listened to pirates in the past, but had never followed the pirate scene, nor understood how to reliably find pirates on the shortwave radio dial. I now know, by the number of emails I receive from SWLing Post readers, that there are many others who feel as I did then. Pirate radio broadcasters do not follow a regular broadcasting schedule, often operate at very low power, and are not necessarily always on the same frequency or even mode. It’s no wonder they’re hard to find. I wish, in those early days of exploring the pirate bands, I had known about the Pirate Radio Annual, produced by pirate radio guru Andrew Yoder. Not only is this book, which explores the pirate radio scene in North America, well written and insightful, it is chock-full of information. It’s a bit like the programming section of the former Passport to Worldband Radio, only focused on pirates. The book also comes with an accompanying audio CD. Yoder, by the way, has been covering the pirate scene for decades; he’s also the former publisher of hobbyist magazine Hobby Broadcasting. I especially like the extensive station profiles of pirates who were active in 2011. Not only can I get more info about the more elusive stations that don’t offer many clues to their raison d’etre–such as Radio Strange Outpost–but it also makes for a handy resource to glean QSL contact info. In fact, I learned a lot about the personalities, broadcast histories and habits of many pirates we’ve featured here (like Undercover Radio, Captain Morgan Shortwave, Wolverine Radio, and North Woods Radio, to name a few). Yoder is able to provide details about these station that your average listener just wouldn’t know, including the types of transmitters used, output power, and historical perspectives. The accompanying audio CD features clips from 78 stations, and includes audio from the transmitter comparison in the book. For about $20.00 US (with shipping), the 2012 Pirate Radio Annual is unquestionably a great buy for those interested in pirate radio. 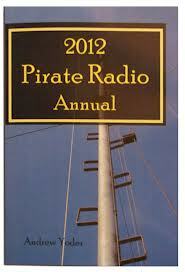 This entry was posted in Books, News, Pirate Radio, Reviews, Shortwave Radio, What's On Shortwave and tagged 2012 Pirate Radio Annual, 2012 Pirate Radio Annual Review, Andrew Yoder, Pirate Radio, Shortwave Pirates, Shortwave Radio, Shortwave Radio Listening, SWLing on August 22, 2012 by Thomas. I have learned quite a lot about pirate radio listening. Cant wait yo order Pirate Radio Annual. Pirate radio listening will keep my interest in sw.